The Best Bipolar 2 blogs from thousands of top Bipolar 2 blogs in our index using search and social metrics. Data will be refreshed once a week. 2.4 Bipolar Borderline | Bipolar II Disorder. Borderline Personality Disorder. 2.5 Bipolar Me | My Experience Only. Bipolar 2 blogs newsletter is a comprehensive summary of the day's most important blog posts and news articles from the best Bipolar 2 blogs websites on the web, and delivered to your email inbox each morning. To subscribe, simply provide us with your email address. San Francisco, CA About Blog This is a community for people living with Bipolar 2, their loved ones, and anyone wanting to understand. Facebook fans 1,177,938. Twitter followers 536,857. About Blog Hannah Blum is an author of 27 years old with bipolar 2 disorder. And also works as a blogger for the mental health organization HealthyPlace and have experience as a mental health advocate with organizations such as the National Alliance on Mental Illness (NAMI). Describes her journey through this blog. Facebook fans 3,142. Twitter followers 643. About Blog A blog about being diagnosed with and learning to cope with Bipolar II disorder. 4. Bipolar Borderline | Bipolar II Disorder. Borderline Personality Disorder. About Blog This blog is about my mental illness and my life. My name is Preslee. I have Bipolar II Disorder, Borderline Personality Disorder, Panic Disorder, Generalized Anxiety, and PTSD. My life is getting better everyday. This blog is about my life and my illness as I see them. I find quotes or facts along the way and share them with my readers. Facebook fans 2,570. Twitter followers n/a. 5. Bipolar Me | My Experience Only. About Blog I’m a freelance writer/editor with bipolar disorder, type 2. For many years, I was diagnosed with unipolar depressions (with anxiety), but the new diagnosis fits me better and my new meds are keeping me much more on the level. I write about mental health issues (obviously), including talk therapy, medication, books, bullying, social aspects, and public policy, but mostly my own experiences. About Blog I am a writer, photographer, artist and teacher in South Wales, UK. I have Bipolar II. About Blog My name is Stephanie and this blog is about my journey. Perhaps the title of my blog is a dead giveaway BUT in case it isn’t I’d like to clarify that I have Bipolar; Bipolar II to be exact. I want to show, inspire and build confidence within individuals who have Bipolar, those who know someone with bipolar, and individuals with absolutely no bipolar connections. 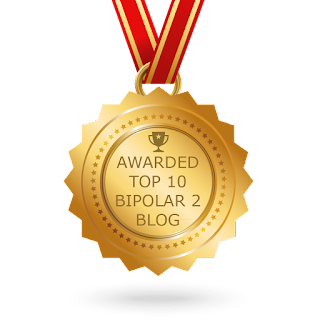 CONGRATULATIONS to every blogger that has made this Top Bipolar 2 Blogs list! This is the most comprehensive list of best Bipolar 2 blogs on the internet and I’m honoured to have you as part of this! I personally give you a high-five and want to thank you for your contribution to this world.